At Singer Vehicle Design "everything is important". It's the credo to which each of the company's employees subscribes, and that can be seen in the product they roll out. Every Porsche 911 Reimagined By Singer is an example of everything being important. It can also be seen in the words hanging from the ceiling, a not-so-gentle reminder to the people in the building that their decisions should always be biased toward quality. Porsche loving enthusiasts with gobs of discretionary income have felt the quality in Singer's offerings first hand, and put their money down on the dotted line. 100 of them, exactly, as the first triple-digit example rolled out of their assembly shop yesterday headed to its new owner. These machines sell sometimes for more than half a million dollars, but they can't make them fast enough. With a backlog in the high double digits, Singer is always busy making the next commission. Rob Dickinson, ex-Catherine Wheel front man, brought his idea to life at least a half dozen years ago, and it's been a meteoric rise ever since. Singer were given mainstream motoring media attention in an episode of /Drive's Chris Harris on Cars back in 2013. In those early days, the company were producing no more than a handful of cars per year, but they've experienced significant growth over the last two years or so that sees them producing dozens of cars annually. When we visited their facility a couple of years ago, there were still no more than a dozen employees around the shop, but as you can see in the picture above, they've expanded their workforce significantly as well. Rumor has it that they've purchased a new building, and are subcontracting out some of the prep work now to keep production on schedule. It's safe to say that the demand for these incredible cars isn't going to wane anytime soon. Congratulations to Singer Vehicle Design on 'reimagining' 100 gorgeous examples. Here's to the next hundred! 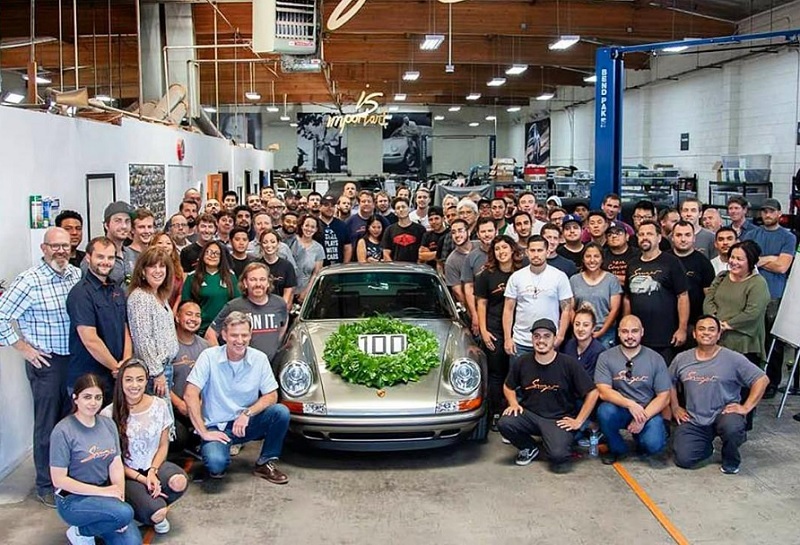 The 100th car in question can be seen in various instagram posts from yesterday. It is a beautiful silver example, but we don't know much beyond that. As per usual, Singer is tight lipped about the car, and there's no indication of who might have commissioned the 100th build, though a few posts have christened the car #AlabamaCommission. I have been to their facility for the last three years. They are always improving the product and use common sense to get the job done right.